This test has 113 questions from the DVSA revision question bank on safety and your vehicle including tyre pressures, fuel consumption, route planning, and emissions. The average score for this test is 89%. Can you beat that? You should carry out frequent checks on all fluid levels but particularly brake fluid. As the brake pads or shoes wear down the brake fluid level will drop. If it drops below the minimum mark on the fluid reservoir, air could enter the hydraulic system and lead to a loss of braking efficiency or complete brake failure. Keeping your vehicle’s tyres correctly inflated is a legal requirement. Your vehicle will use less fuel and have a shorter stopping distance with correctly inflated tyres. Rapid acceleration and heavy braking lead to increased fuel consumption, and wear on your vehicle. Having your vehicle regularly serviced will maintain its efficiency, produce cleaner emissions and reduces the risk of a breakdown. The humps are there for a reason – to reduce the speed of the traffic. Don’t accelerate harshly between them as this means you will only have to brake harshly to negotiate the next hump. Harsh braking and accelerating uses more fuel. Although carbon dioxide is still produced, a catalytic converter reduces the toxic and polluting gases by up to 90%. Unleaded fuel must be used in vehicles fitted with a catalytic converter. When leaving your car take all valuables with you if you can, otherwise lock them out of sight. Having your car registration number etched on all your windows is a cheap and effective way to deter professional car thieves. Accelerating and braking gently and smoothly will help to save fuel, reduce wear on your vehicle and is better for the environment. Trams are powered by electricity and therefore don't emit exhaust fumes. They also ease traffic congestion by offering drivers an alternative to using their car. If you can see valuables in your car so can a thief. If you can’t take them with you lock them out of sight or you risk losing them, known as ‘dry’ steering. Your vehicle will use less fuel if you avoid heavy acceleration. The higher the engine revs, the more fuel you will use. Using the same gear, a vehicle travelling at 70mph will use up to 30% more fuel to cover the same distance, than at 50mph. However, don’t travel so slowly that you inconvenience or endanger other road users. When you’re going to drive, ensure that you’re wearing suitable clothing. Comfortable shoes will ensure that you have proper control of the foot pedals. It is illegal to pour engine oil down any drain. Oil is a pollutant and harmful to wildlife. Dispose of it safely at an authorised site. No one likes to spend time in traffic queues. Try to avoid busy times related to school or work travel. As well as moving vehicles you should also consider congestion caused by parked cars, buses and coaches around schools. If you are carrying anything on a roof rack, make sure that any cover is securely fitted and does not flap about while driving. Aerodynamically designed roof boxes are available which reduce wind resistance and, in turn, fuel consumption. Try not to use your car as a matter of routine. For shorter journeys, consider walking or cycling instead – this is much better for both you and the environment. Walking or cycling are good ways to get exercise. Using public transport also gives the opportunity for exercise if you walk to the railway station or bus stop. Leave the car at home whenever you can. Uneven wear on your tyres can be caused by the condition of your vehicle. Having it serviced regularly will ensure that the brakes, steering and wheel alignment are maintained in good order. Avoid using your car for short journeys. On a short journey the engine is unlikely to warm up fully and will therefore be running less efficiently; this will result in it using more fuel and producing higher levels of harmful emissions. When you leave your car always engage the steering lock. This increases the security of your vehicle, as the ignition key is needed to release the steering lock. If you don’t have your vehicle serviced regularly, the engine won’t burn all the fuel efficiently. This will cause increased fuel consumption and an increase in the amount of harmful emissions it produces. Always switch off the engine, remove the key and lock your car, even if you are only leaving it for a few minutes. Most motoring organisations will give you a detailed plan of your trip showing directions and distance. Some will also include advice on rest and fuel stops. The Highways Agency website will also give you information on roadworks and incidents and gives expected delay times. A security-coded radio can deter thieves as it is likely to be of little use when removed from the vehicle. Seat belts save lives and reduce the risk of injury. If you are carrying passengers under 14 years of age it’s your responsibility as the driver to ensure that their seat belts are fastened or they are seated in an approved child restraint. If you find that your vehicle bounces as you drive around a corner or bend in the road, the shock absorbers might be worn. Press down on the front wing and, if the vehicle continues to bounce, take it to be checked by a qualified mechanic. If you’re involved in a collision, head restraints will reduce the risk of neck injury. They must be properly adjusted. Make sure they aren’t positioned too low, in a crash this could cause damage to the neck. Catalytic converters reduce the harmful gases given out by the engine. The gases are changed by a chemical process as they pass through a special filter. All vehicles need to be serviced to keep working efficiently; an efficient engine uses less fuel and produces less harmful emissions than an engine running inefficiently. Keeping the vehicle serviced to the manufacturers schedule should also keep it reliable and reduce the chance of it breaking down. Don’t ignore this warning light. A fault in your braking system could have dangerous consequences. It’s an offence to park there. You will be causing an obstruction by obscuring the view of both pedestrians and drivers. Transport is an essential part of modern life but it does have environmental effects. In heavily populated areas traffic is the biggest source of air pollution. Eco-safe driving and riding will reduce emissions and can make a surprising difference to local air quality. Consult the vehicle handbook or garage before driving the vehicle. Only drive to a garage if it is safe to do so. If you’re not sure get expert help. Some modern batteries are maintenance-free. Check your vehicle handbook and, if necessary, make sure that the plates in each battery cell are covered. Harsh braking, frequent gear changes and harsh acceleration increase fuel consumption. An engine uses less fuel when travelling at a constant low speed. You need to look well ahead so you’re able to anticipate hazards early. Easing off the accelerator and timing your approach, at junctions, for example, can reduce the fuel consumption of your vehicle. Passengers should always be secured and safe. Children should be encouraged to fasten their seat belts or approved restraints themselves from an early age so that it becomes a matter of routine. As the driver you must check that they are fastened securely. It’s your responsibility. Your tyres are your only contact with the road. To prevent problems with braking and steering keep your tyres free from defects; they must have sufficient tread depth and be correctly inflated. Correct tyre pressures help reduce the risk of skidding and provide a safer and more comfortable drive or ride. If you have to leave valuables in your car, always lock them out of sight. If you can see them, so can a thief. The vehicle watch scheme helps reduce the risk of having your car stolen. By displaying high visibility vehicle watch stickers in your car you are inviting the police to stop your vehicle if seen in use between midnight and 5 am. You MUST deactivate any frontal passenger airbag when using a rear-facing baby seat in a front passenger seat. It is ILLEGAL if you don’t. If activated in a crash it could cause serious injury or death. Ensure you follow the manufacturers instructions. In some cars this is now done automatically. Catalytic converters are designed to reduce a large percentage of toxic emissions. They work more efficiently when the engine has reached its normal working temperature. By law you must not sound your horn in a built-up area between 11.30 pm and 7.00 am. The exception to this is when another road user poses a danger. Eco-safe driving is all about becoming a more environmentally-friendly driver. This will make your journeys more comfortable as well as considerably reducing your fuel bills and reducing emissions that can damage the environment. Trailers and caravans may be left in storage over the winter months and tyres can deteriorate. It’s important to check their tread depth and also the pressures and general condition. The legal tread depth applies to the central three quarters of its breadth over its entire circumference. If you see that parts of the tread on your tyres are wearing before others, it may indicate a brake, steering or suspension fault. Regular servicing will help to detect faults at an early stage and this will avoid the risk of minor faults becoming serious or even dangerous. If your vehicle is fitted with drum brakes they can get hot and lose efficiency. This happens when they’re used continually, such as on a long, steep, downhill stretch of road. Using a lower gear will assist the braking and help prevent the vehicle gaining momentum. When leaving your vehicle unattended, use a secure car park whenever possible. The brakes on your vehicle must be effective and properly adjusted. If your vehicle pulls to one side when braking, take it to be checked by a qualified mechanic. Don’t take risks. When checking your tyres for cuts and bulges in the side walls, don’t forget the inner walls (ie. those facing each other under the vehicle). Too much oil in the engine will create excess pressure and could damage engine seals and cause oil leaks. Any excess oil should be drained off. It can be frustrating and worrying to find your planned route is blocked by roadworks or diversions. If you have planned an alternative you will feel less stressed and more able to concentrate fully on your driving or riding. If your original route is mostly on motorways it’s a good idea to plan an alternative using non- motorway roads. Always carry a map with you just in case you need to refer to it. If your wheels are out of balance it will cause the steering to vibrate at certain speeds. It is not a fault that will rectify itself. You will have to take your vehicle to a garage or tyre fitting firm as this is specialist work. When adult passengers are travelling in a vehicle, it is their own responsibility to wear a seat belt. However, you should still remind them to use a seat belt. Print or write down your route before setting out. Some places are not well signed so using place names and road numbers may help you avoid problems en route. Try to get an idea of how far you’re going before you leave. You can also use it to re-check the next stage at each rest stop. An unlocked car is an open invitation to thieves. Leaving the keys in the ignition not only makes your car easy to steal, it could also invalidate your insurance. To help keep your car secure when you leave it, you should always remove the key from the ignition, lock it and take the key with you. Don’t make it easy for thieves. Missing out some gears helps to reduce the amount of time you are accelerating and this saves fuel. You don’t always need to change up or down through each gear. As you accelerate between each gear more fuel is injected into the engine than if you had maintained constant acceleration. Fewer gear changes means less fuel used. This means that they do not emit toxic fumes, which add to city pollution problems. They are also a lot quieter and smoother to ride on. Missing out intermediate gears when appropriate, helps to reduce the amount of time spent accelerating and decelerating - the time when your vehicle uses most fuel. Having your vehicle broken into or stolen can be very distressing and inconvenient. Avoid leaving your vehicle unattended in poorly-lit areas. When leaving your vehicle unattended it is best to take valuables with you. If you can't, then lock them out of sight in the boot. If you can see valuables in your car, so can a thief. Think about the effect your parking will have on other road users. Don’t forget that not all vehicles are the size of a car. Large vehicles will need more room to pass and might need more time too. Parking out of the view of traffic, such as before the brow of a hill, causes unnecessary risks. Think before you park. By looking well ahead and recognising hazards in good time, you can avoid last-minute harsh braking. Watch the traffic flow and look well ahead for potential hazards so you can control your speed accordingly. Avoid over-revving the engine and accelerating harshly as this increases wear to the engine and uses more fuel. The emphasis is on hazard awareness and planning ahead. By looking well ahead you will have plenty of time to deal with hazards safely and won’t need to brake sharply. This will also reduce damage to the environment. It is not always necessary to change up or down through each gear. Missing out intermediate gears helps to reduce the amount of time you are accelerating. Because fuel consumption is at its highest when accelerating this can save fuel. Always try to use the accelerator smoothly. Taking your foot off the accelerator allows the momentum of the car to take you forward, especially when going downhill. This can save a considerable amount of fuel without any loss of control over the vehicle. Having a pleasant journey can have safety benefits. You will be less tired and stressed and this will allow you to concentrate more on your driving or riding. If you are away from home, try to avoid leaving your vehicle unattended in poorly-lit areas. If possible park in a secure, well-lit car park. At night all vehicles must display parking lights when parked on a road with a speed limit greater than 30 mph. They should be close to the kerb, facing in the direction of the traffic flow and not within a distance as specified in The Highway Code. Your vehicle is like a shop window for thieves. Either remove all valuables or lock them out of sight. Various route planners are available on the internet. Most of them give you various options allowing you to choose the most direct, quickest or scenic route. They can also include rest and fuel stops and distances. Print them off and take them with you. If you have adult passengers, it's their responsibility to wear a seat belt, but you should still remind them to use one as they get in the car. It's your responsibility to make sure that all children in your car are secured with an appropriate restraint. Exemptions are allowed for those with a medical exemption certificate. When you leave your vehicle parked on a road, switch off the engine and secure the vehicle. Make sure no valuables are visible, shut all the windows, lock the vehicle, and set the alarm if the vehicle has one. Exhaust emissions are harmful to health. Together with vibration from heavy traffic, this can result in damage to buildings. Most petrol and diesel fuels come from a non-renewable source. Anything you can do to reduce your use of these fuels will help the environment. We are all responsible for the environment we live in. If each driver takes responsibility for conserving fuel, together it will make a difference. Not only will you save about 15% of your fuel by driving smoothly, but you will also reduce the amount of wear and tear on your vehicle as well as reducing pollution. You will also feel more relaxed and have a more pleasant journey. 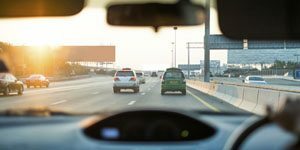 Although the car is a convenient form of transport it can also cause damage to health and the environment, especially when used on short journeys. Before you travel consider other types of transport. Walking and cycling are better for your health and public transport can be quicker, more convenient and less stressful than driving. Emission tests are carried out to ensure your vehicle's engine is operating efficiently. This ensures the pollution produced by the engine is kept to a minimum. If your vehicle is not serviced regularly, it may fail the annual MOT test. Whenever possible leave your car in a secure car park. This will help stop thieves. Using a vehicle for short journeys means the engine does not have time to reach its normal running temperature. When an engine is running below its normal running temperature it produces increased amounts of pollution. Walking and cycling do not create pollution and have health benefits as well. Check your tyre pressures frequently – normally once a week. If pressures are lower than those recommended by the manufacturer, there will be more ‘rolling resistance’. The engine will have to work harder to overcome this, leading to increased fuel consumption. The restraint should be adjusted so that it gives maximum protection to the head and neck. This will help in the event of a rear- end collision. Traffic jams today are often caused by the volume of traffic. However, inconsiderate parking can lead to the closure of an inside lane or traffic having to wait for oncoming vehicles. Driving slowly in traffic increases fuel consumption and causes a build-up of exhaust fumes. Avoiding busy times means that you are not adding needlessly to traffic congestion. Other advantages are that you will use less fuel and feel less stressed. If your vehicle is stationary and is likely to remain so for some time, switch off the engine. We should all try to reduce global warming and pollution. Traffic calming measures help keep vehicle speeds low in congested areas where there are pedestrians and children. A pedestrian is much more likely to survive a collision with a vehicle travelling at 20 mph than at 40 mph. Top up the battery with distilled water and make sure each cell plate is covered. Always remove the key and lock your car even if you only leave it for a few minutes. Don’t park your vehicle where it may obstruct an access to a business or property. Think carefully before you slow down and stop. Look at road markings and signs to ensure that you aren’t parking illegally. Batteries contain acid, which is hazardous, and they must be disposed of safely. This means taking them to an appropriate disposal site. It’s a good idea to plan an alternative route in case your original route is blocked for any reason. You’re less likely to feel worried and stressed if you’ve got an alternative in mind. This will enable you to concentrate fully on your driving or riding. Always carry a map that covers the area you will travel in. An immobiliser makes it more difficult for your vehicle to be driven off by a thief. It is a particular deterrent to opportunist thieves. Harmful gases in the exhaust system pollute the atmosphere. These gases are reduced by up to 90% if a catalytic converter is fitted. Cleaner air benefits everyone, especially people who live or work near congested roads. Turning the steering wheel when the car is not moving is known as dry steering. It can cause unnecessary wear to the tyres and steering mechanism. You should make all efforts to ensure a correct child restraint is used, with very few exceptions. If in specific circumstances one is not available, then an adult seat belt MUST be used. Unrestrained objects, including people, can be thrown violently around in a collision, and may cause serious injury or even death! Using the controls smoothly can reduce fuel consumption by about 15% as well as reducing wear and tear on your vehicle. Plan ahead and anticipate changes of speed well in advance. This will reduce the need to accelerate rapidly or brake sharply. We should all be concerned about the effect traffic has on our environment. Fumes from vehicles are polluting the air around us. Catalytic converters act like a filter, removing some of the toxic waste from exhaust gases. It is your responsibility as a driver to ensure that children are secure and safe in your vehicle. Make sure you are familiar with the rules. In a few very exceptional cases when a child restraint is not available, an adult seat belt MUST be used. Child restraints and seat belts save lives! Never leave the vehicle’s documents inside it. They would help a thief dispose of the vehicle more easily. Always allow plenty of time for your journey in case of unforeseen problems. Anything can happen, punctures, breakdowns, road closures, diversions etc. You will feel less stressed and less inclined to take risks if you are not ‘pushed for time’. If the airbag activates near a baby seat, it could cause serious injury or even death to the child. It is illegal to fit a rear-facing baby seat into a passenger seat protected by an active frontal airbag. You MUST secure it in a different seat or deactivate the relevant airbag. Follow the manufacturers advice when fitting a baby seat. Planning your journey before you set out can help to make it much easier, more pleasant and may help to ease traffic congestion. Look at a map to help you to do this. You may need different scale maps depending on where and how far you’re going. Printing or writing out the route can also help. Tyres must have sufficient depth of tread to give them a good grip on the road surface. The legal minimum for cars is 1.6 mm. This depth should be across the central three quarters of the breadth of the tyre and around the entire circumference. Wasting fuel costs you money and also causes unnecessary pollution. Ensuring your tyres are correctly inflated, avoiding carrying unnecessary weight and, removing a roof rack that's not in use, will all help to reduce your fuel consumption. Usually a correct child restraint MUST be used. In a few exceptional cases if one is not available an adult seat belt MUST be used. In a collision unrestrained objects and people can cause serious injury or even death. Vehicles can be noisy. Every effort must be made to prevent excessive noise, especially in built-up areas at night. Don’t rev the engine or sound the horn unnecessarily. It is illegal to sound your horn in a built-up area between 11.30 pm and 7 am, except when another vehicle poses a danger. Unless exempt, you and your passengers must wear a seat belt (or suitable child restraint). The seat belts in your car must be in good condition and working properly; they will be checked during its MOT test. If your tyre pressures are low this will increase the drag on the road surface and make the steering feel heavy. Your vehicle will also use more fuel. Incorrectly inflated tyres can affect the braking, cornering and handling of your vehicle to a dangerous level. We'll email you a different test each day so you can ace your theory test!